The time line shows the scales and dates of maps available for the selected area. Look into bygone landscapes with a new app from the US Geological Survey (USGS) and Esri. 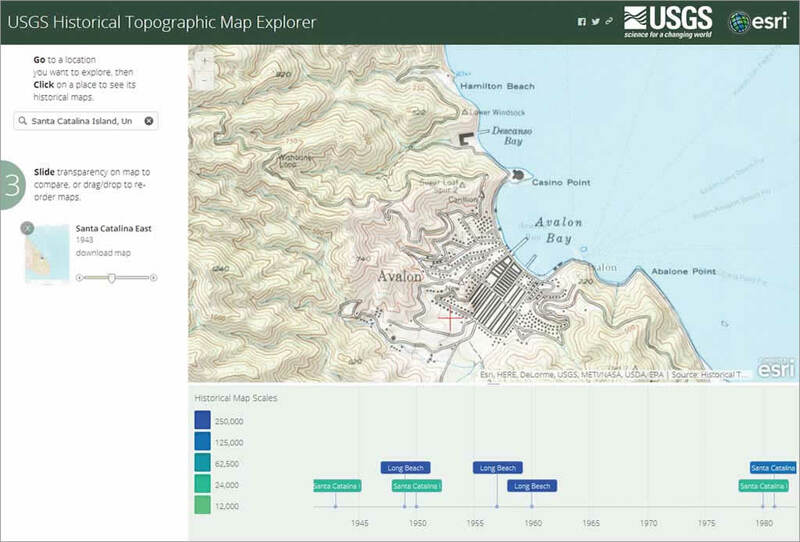 The USGS Historical Topographic Map Explorer app gives you access to more than 178,000 maps—some dating from 1884—from any digital device. Topographic maps are indispensable for everyday use in government, science, industry, land management planning, and recreation.These topographic maps are snapshots of the nation's physical and cultural features at a particular time and show how a specific place has changed over time. Scientists, historians, environmentalists, genealogists, and others researching a particular geographic location or area find these maps valuable in their work. 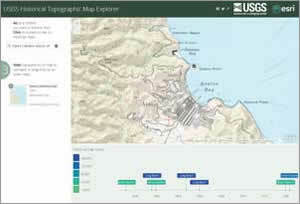 In 2009, USGS began releasing US Topo, a new generation of topographic maps in electronic form. These maps are complemented by the USGS Historical Topographic Map Collection (HTMC), which was officially launched in September 2011. 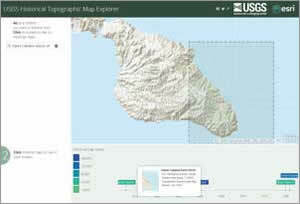 The program's goal was to scan all USGS historic topographic maps published by the USGS since the inception of the topographic mapping program in 1884. Although this goal was met in October 2012, as additional historical maps are discovered, they will be scanned and added. The project has been successful, with more than 6.8 million downloads. In addition to the online collection, HTMC exists as a collection of paper maps in the USGS Clarence King Library in Reston, Virginia. With the selected map displayed in the main window, the transparency can be adjusted to see current features in relation to historic ones. 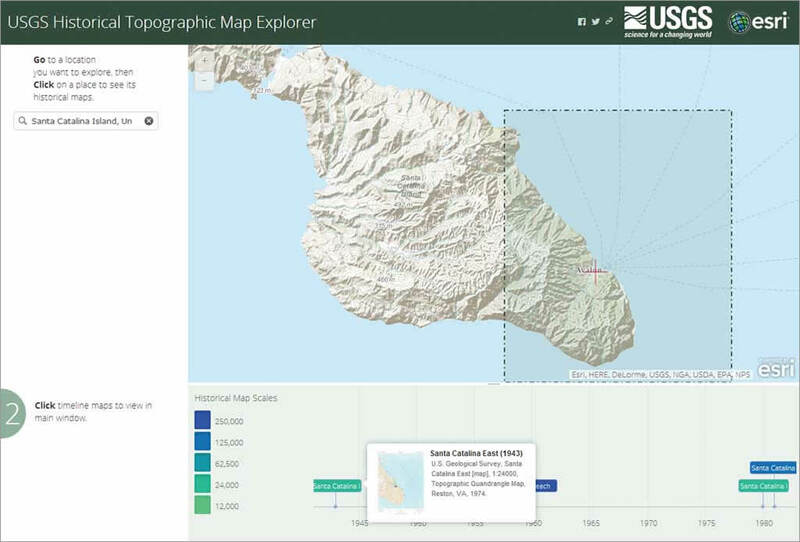 The ArcGIS platform supports sharing this amazing map collection. With this app hosted in ArcGIS Online, anyone can access any map in HTMC as a high-resolution georeferenced image for use in web mapping applications. The app's time line makes it easy to see the scale and dates of available maps. In the past, these maps were available only as printed lithographic copies and more recently, legacy quadrangles were available as free, downloadable GeoPDFs. Now, locating historical maps for a specific area couldn't be easier. Go to the web link historicalmaps.arcgis.com/usgs/. There is no need to download an app. Pan or search for a desired location and click on it. A time line appears showing the maps available for the selected location. In the time line, select a map that is the age and scale desired. The selected map will display in the main window. You can move the slider bar under its thumbnail on the left side of the main window to see the changes over time. You can share this map or save a copy of it to your desktop. The app is on GitHub, the web-based hosting service for software development, so custom collections of historical maps can be created. For more information, go to nationalmap.gov/historical/index.html.